March 1, 2017: Jeff Heotzler Racing (JHR) is extremely excited to announce a partnership with Vinny Salerno and Four Star Motorsports that will allow “The Jeffer” to make a serious bid for his 5th Orange County Fair Speedway modified championship this season. Four Star Motorsports, known for its highly professional and successful operations that in the past featured such legends as Brett Hearn and Tim McCreadie, will return to the sport after a brief hiatus and provide key support and resources to Jeff Heotzler Racing. A fresh Morrison Performance big block engine will bolted in between the frame rails and Keizer Wheels will be utilized on all four corners of the team’s TEO Pro Car. Signing on as the team’s primary sponsor is Extreme Energy Solutions, a research and development firm, a manufacturer, distributor of emissions reduction technology, and other consumer green tech products. “The Jeffer” will headline the Extreme Energy quartet of drivers that also include Tommy Vigh Jr., Connor Otten and Roddy Watts. “We are very grateful that Samuel Burlum (CEO of Extreme Energy Solutions) stepped up and made this happen. We look forward to flying the Extreme Energy colors,” stated Heotzler. First up for the newly formed team is the Short Track Super Series opener at OCFS on April 8th. The regular points season and race for the championship then kicks off on Saturday April 22nd. For the latest news and results, follow Jeff Heotzler Racing on Facebook and Twitter (@JeffHeotzlerRacing) or visit jeffheotzlerracing.com. Here are some highlights from the 2016 Northeast Dirt Hall of Fame Induction Ceremony held at the Dirt Motorsports Hall of Fame in Weedsport, New York. In 6 days, The Jeffer will be inducted into the Northeast Dirt Modified Hall of Fame. We’ll be counting down some of the key moments in his legendary 38 year (and counting) career. 1988-1989: The Jeffer and the potent J&S Racing 74 machine drove to 2 straight Eastern States Weekend Small Block Chevy Underpricers 100 victories. Not only did he collect the big check for consecutive years but also the pace car, driving home two Chevrolet Camaros which back in the late 80s, were valued at over $15,000. In 1989, The Jeffer ducked under Jimmy Horton on the 69th lap and was able to hold off the legendary driver for the remaining circuits for the repeat. In 7 days, The Jeffer will be inducted into the Northeast Dirt Modified Hall of Fame. We’ll be counting down some of the key moments in his legendary 38 year (and counting) career. In 8 days, The Jeffer will be inducted into the Northeast Dirt Modified Hall of Fame. We’ll be counting down some of the key moments in his legendary 38 year (and counting) career. 1984: The Jeffer sat atop of the 320 Modified world by capturing the Miller Beer Mr. Dirt 320 Championship in “Hazel”, his Kenny Weld J17. The Jeffer won Ithaca Gun Shootout series races at Woodhull and Accord that year en route to the crown. It would be the only Mr. Dirt title for The Jeffer as he came close to winning again in 1985 and 1986 but ultimately had to settle for 2nd in both years. In 9 days, The Jeffer will be inducted into the Northeast Dirt Modified Hall of Fame. We’ll be counting down some of the key moments in his legendary 38 year (and counting) career. 1980: The Jeffer wouldn’t know it at the time, but he would go on to win one of his most coveted victories of his young career. The Jeffer steered the Slingerland 25 to the inaugural 320 (later 358) Modified Championship at the now defunct “Moody Mile” at the New York State Fairgrounds. The Jeffer enjoyed much success at the Mile in the 320/358 division over the course of his career and was named by AARN in 2015 as the 5th all-time greatest small block driver in the track’s history, amassing 1 Win, 7 Top 5’s and 11 Top 10’s in 20 starts. In 10 days, The Jeffer will be inducted into the Northeast Dirt Modified Hall of Fame. We’ll be counting down some of the key moments in his legendary 38 year (and counting) career. 1979: The Jeffer scores his first career victory aboard the Ken Slingerland owned 25 as he takes the checkered flag at the legendary Nazareth Speedway. The Jeffer would go on to win a total of 8 races in the 320 division at Nazareth. 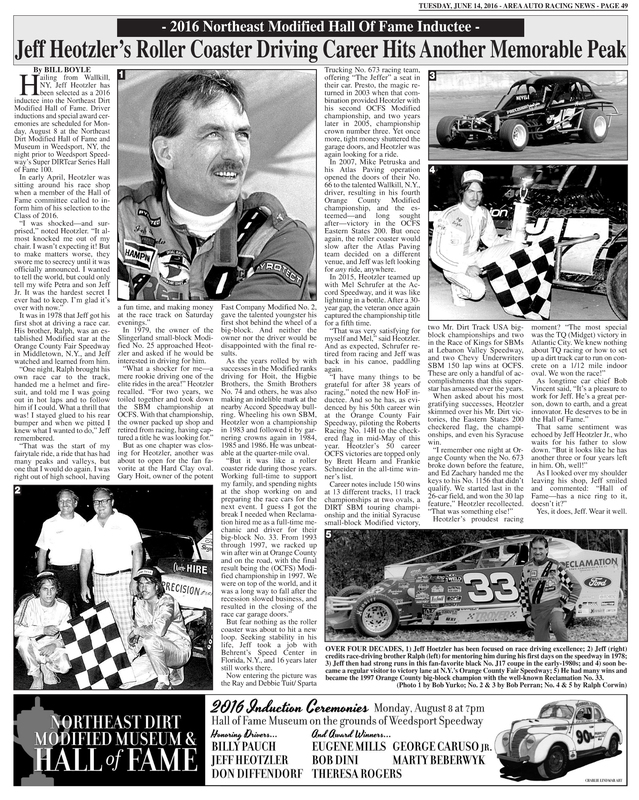 The following article, written by Bill Boyle, appeared in this week’s Area Auto Racing News, highlighting the racing career of The Jeffer. 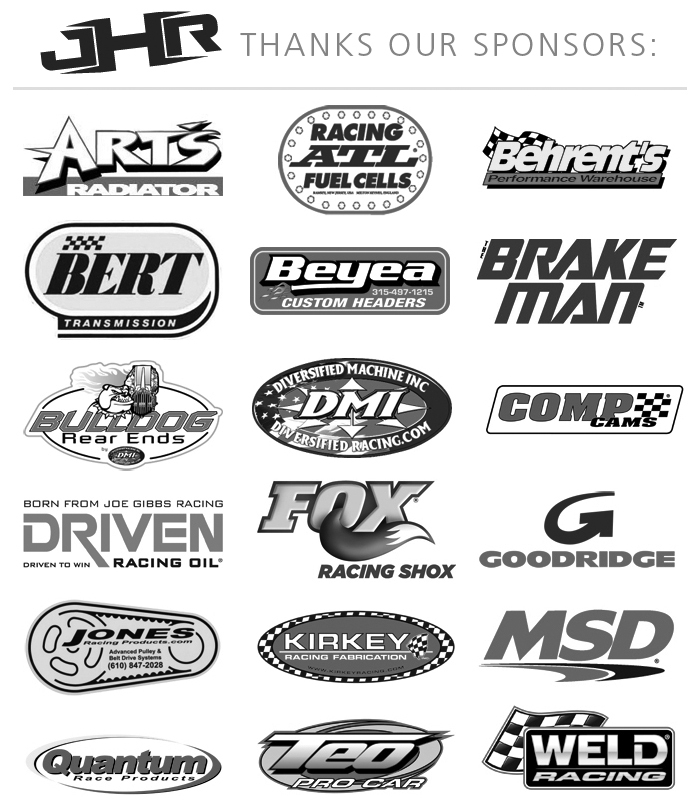 It’s been a tough season so far for The Jeffer and the JHR team, but they are not giving up. Five Mile Point just introduced a brand new 4-race Sunday night series called the “Summer Slam”. The first race is this Sunday, June 12th and The Jeffer plans on being there in the Jeff Heotzler Racing J17 small block.